It hardly seems possible, but here we are at the end of another year (and catapulting all too quickly into the new one.) I don't think we are the only ones who are wondering how the heck 2008 happened so fast. So, in keeping with (recent) tradition, our family exploits of the past year are duly recorded here for posterity... and for the entertainment and edification of anyone who remotely cares! I am giving up apologising for my lack of brevity. 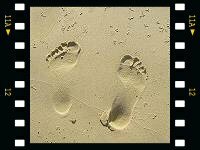 2008 may have flown, but between the five of us - and a full-on 12 months - there is plenty to report. I finished off last year's spiel with our grand plans for holiday time sun, sand and surf (without even having to leave the comforts of home.) Mother Nature didn't oblige - we managed a beachy day for Christmas, but most of the rest of our time at home we copped rain, rain, rain. 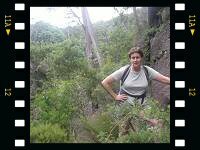 We were lucky with our Blue Mountains/canyoning escapade this time, though. 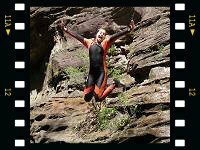 While it bucketed down on the coast, the Mountains hosted glorious blue skies, and so Ali was successfully baptised into the world of canyoning with a 12 hour epic day doing Bells Canyon. A few days later we gave Zoe a bit of a taste of it when we did some li-loing along part of Wollangambe Canyon with friends. Then it was back home to the wet, which lasted through the rest of Marc's leave - and indeed the kids' - and pretty much put paid to the stay-at-home beach holiday. We didn't commit to the Big Ride again this year - and instead decided to tick a few boxes with various organised one-day rides that we hadn't done before. First up was Loop The Lake in March - an approx. 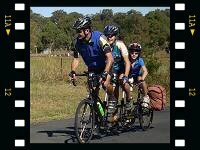 90km ride around Lake Macquarie - which we all did on the usual triple and tandem combo. We were all suitably stuffed at the end of that one. It was a pretty hilly course, and there weren't as many 'lake' views as you might anticipate. But it was an achievement nonetheless, and a chance to catch up with other tandem riding friends. 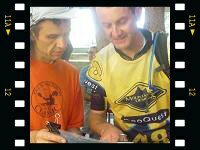 In April we braved chillier temperatures to spend a weekend riding with other Coffs BUG members in Armidale. 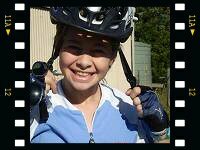 We enjoyed the sensational autumn colours, and a great ride to Uralla and back along the backroads. Sometimes it's the little things you discover on these sort of rides (like an apple orchard with the best tasting fuji apples ever) that make it all worthwhile. Marc and I continued our Saturday morning riding - often racking up 80-90km from home and back - on our road tandem, interspersed with an occasional foray into the nearby State Forest on our MTBs. Around that time he was made a tantalising offer - to participate in Geoquest, a 48 hour teams adventure endurance race/event held on the June long weekend. 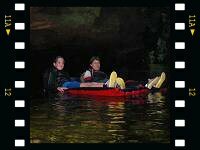 It involves paddling, trekking and mountain bike riding, and is hosted in a different place every year. This year the base happened to be right on our doorstep at Emerald Beach - although the course ranged as far as the Nymboida. To the casual (and not so casual) observer it was totally insane, but he was in his element. Seriously, only crazy people go gallavanting around the countryside for over 48 hours with no sleep! Right? 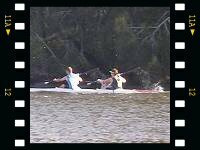 His training for that was the catalyst to dust off our kayaks and get down to the Saturday afternoon paddles with Bonville kayak club. 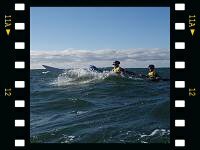 (The paddle from Coffs to Woolgoolga in the event was still his first time out on the ocean in a sea kayak!). He bought himself some specialised equipment and footwear, and did a fair bit of slogging up and down beaches and forest roads as training. His team (of 4) were the only ones to ride tandems on the dirt roads. Did I say dirt? 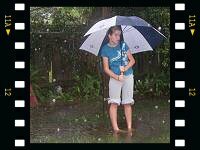 It rained! I am still finding bits of mud in the crevices of "my" tandem, and I'm not sure I've quite forgiven Richard and Mardi for giving Marc a new obsession. Cue the next bout of insanity. Somehow I .. we... agreed to take part in a 24 hour/500km velodrome ride to raise money for charity (ROMAC) the first weekend of the spring school holidays. That's round and round a velodrome - all day and overnight - on our tandem with a bunch of other mad cyclists. I thought my bum would never recover (even though we finished it in about 20 hours), but within two weeks we were headed up to Queensland with the kids to do the Brisbane to Gold Coast ride (100km). Sadly that is one marked 'Unfinished Business'. Around halfway Marc (on the triple with Ali and Zoe) was taken out by someone hitting the brakes - hard - in front of him (her pedal came off...!) He couldn't stop in time, and couldn't get around her. The triple went down - and Cait and I, drafting them, couldn't stop either. *Crash! * Schmidts and jellybeans all over the road. In the wash up we were very lucky - mainly just grazes and bruises - though I came out of it worst, needing stitches to a gash on my elbow. Marc rode the triple solo through to the next checkpoint, but the rest of us were, sadly, sag wagon cases. He caught a train back to Brisbane to retrieve the car, collected us, and that was that. 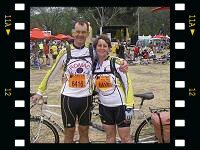 He and I were back on two wheels a week later, down in Melbourne for the Around The Bay ride. We did the 210km course - from Melbourne down to Sorrento, across in the ferry to Queenscliffe, and back around, through Geelong, to the city. Dismantling and packaging the tandem for plane travel (and putting it back together again) was almost as much of a marathon effort as the ride itself. Still, a great ride, and one very big box to have ticked! Somehow we haven't been on the bikes much since then - but there has been plenty else happening throughout the year to keep everyone busy. 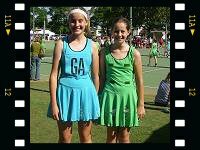 Cait and Ali played rep netball again - Cait playing 15s for Coffs and Ali the 13s for Woopi. (ie. Woolgoolga). As usual there were a few weekends taken up with rep carnivals, leading up to State Age - in Newcastle this year - at the end of June. 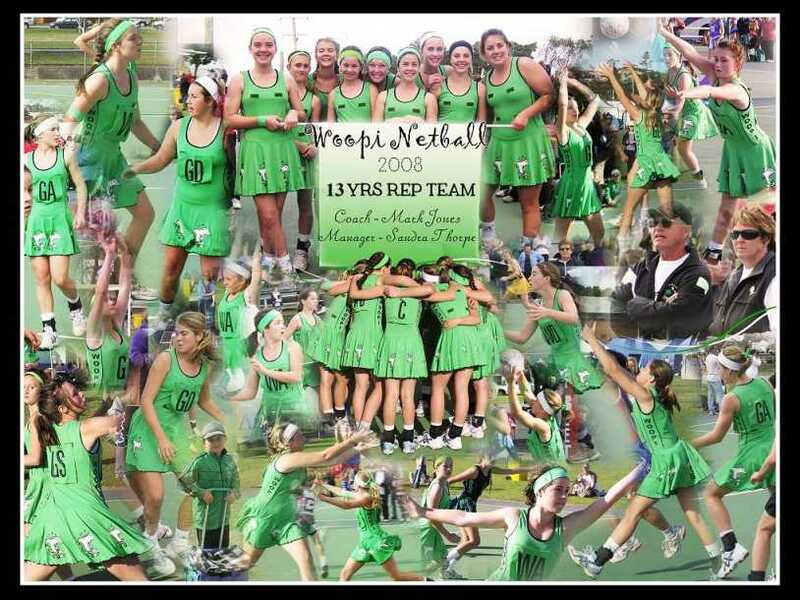 Both teams placed in their respective top 10s - both in Division 2 - so all in all a successful tournament, particularly for the Woopi girls coming up from Division 3. 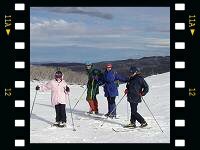 Seeing we were 'on the road' for those school holidays, I came up with the idea of detouring further south so as to take the kids Cross Country skiing. 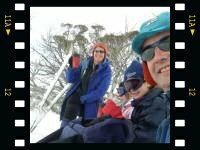 Somehow, despite some misgivings (and at one point wondering if it would even snow this year at all) we had a fabulous couple of days* in and around the cross country trails at Perisher - just as the Snowies received an awesome dump of snow. On that trip we also managed to catch up with quite a few "old" friends scattered about the state - in Newcastle and Jindabyne, and then Tumut, and out beyond Parkes as we took the long way home! 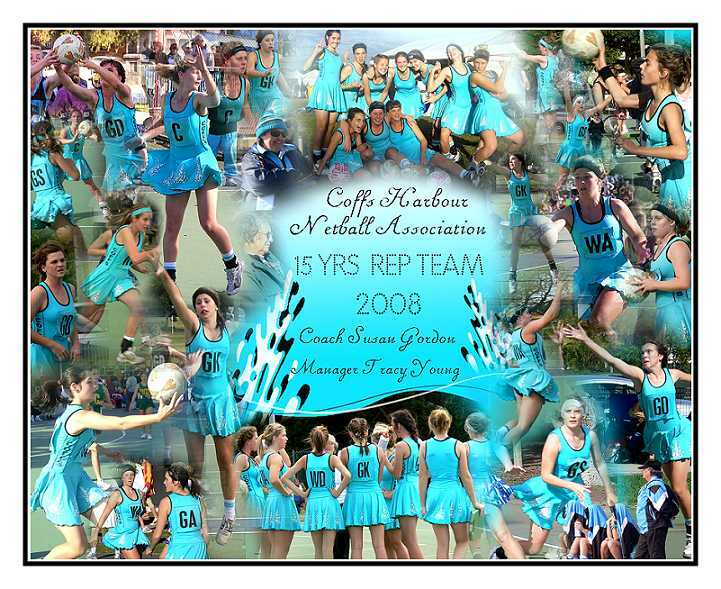 Meanwhile, on a weekly basis, there was almost more netball than a non-playing netball Mum could bear. Zoe played her first year of comp- in a Junior team coached by her biggest sister! They came runners up, so that was pretty exciting. Marc coached an Intermediate team with Cait and Ali in it (who had decided they would actually prefer to play with rather than against each other.) That team started slowly, but gradually worked their way up the ladder with strategic wins, pulling off a Grand Final berth. In the end they too came away as Runners Up, but still... The trophy shelves runneth over. Cait was involved in the school musical - dancing - and followed that up with participation in the NSW Schools Spectacular in November. Their dance, for anyone who watched it on TV, was the Beijing Tribute, unfortunately edited quite radically in both the highlights and the 'full' screening on ABC2. That was a disappointment, but the actual event was a high. (I swung a plane trip down to Sydney for the weekend just to go and see it.) She also managed to time her Yr 10 academic run to perfection, coming away with academic achievement awards - placing in the top handful of high achievers in Yr 10, and gaining very respectable School Certificate results. She came home from their Yr 10 formal with one of the special fun awards - Yr 10 girl with the Best Smile. It is little things like that that make a parent just as chuffed as any academic or sporting achievement they might receive. She is also developing quite an artistic streak, winning first prize of $100 for a piece of school artwork exhibited in a local fair, and she is embarking on (she hopes) a money earning enterprise by painting shoes! Ali enjoyed her first year at high school, and kept up the family tradition with academic achievement awards mid-year and at the end. Her nonchalant swimming ability also netted her 13 yrs girl swimming champion; she keeps the swimming skill and fitness ticking over by continuing with a squad once a week, but without any real competitive drive. 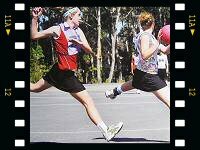 Any sporting dreams she might have are reserved for netball, which she loves. She was playing the flute but isn't passionate enough about it to practice, so the privilege of playing with the school band was withdrawn (by Mum.) Lately she's become a bit of a beach girl - down there with her girlfriends every chance she can get. She's also started the old teenager growth spurt, and, miraculously,"at times" seems to be getting on better with big sister. (When they aren't fighting.) OK, so that's more often than not in terms of presenting a united front to the parental units - in particular their mother - but I guess every cloud has a silver lining. Zoe just finished Year 4, and is more than competently living up to the Schmidt name and legacy at the primary school. With icing on top, thank you very much - she was recognised in the local paper for achieving two High Distinctions in the University of NSW competition, and she was awarded a class academic achievement award at the presentation. The weekly swimming paid off for her as well - (along with her mother talking her into participating in every race at the school swimming carnival.) She surprised even herself by getting the school Junior girls swimming champion award, learning that if you give everything a go, you just never know. She also proved that she, too, can run a bit, pulling off a second place in the school cross country. With tennis lessons once a week, life is pretty busy for a 10 year old, but if you had to describe her in one word you'd say "bookworm". 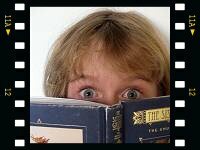 She usually has a few books on the go at once, and will read whenever and wherever she can. Zoe and Ali both went to the Opera House in June to play recorder in the Festival of Instrumental music. [The link is already featuring the 2009 event.] I traipsed down to Sydney with them, and what an emotional experience that was. They might have been hard to spot in the combined public schools recorder ensemble of about 700 kids, but Wow! You'd never imagine a bunch of recorders could sound so good! Zoe was pretty rapt that on her first actual visit to the Opera House she was a performer! (And, much like at the Schools Spectacular, I wasn't short on goosebumps, a silly, proud mum grin, and an emotional tear or two...) They have all been really lucky to have such opportunities. Marc is still not going away so much for work, which is wonderful. Mind you, he's not wasting the opportunity a more 'normal' life presents. The netball coaching secured him an early mark one afternoon a week, and as of the end of the year he managed to sign himself up to play Touch three nights a week, AND get himself on the committee of Woopi Touch, doing the admin job of uploading all the scores each week. During the year he played away in a few tournaments with different teams... an "Australian over 40s" team against NZ (and New Guinea and others) up in Brissy in March, plus a "State of Origin" vs QLD in September, and then in a State Cup mixed seniors team at Port Macquarie in December with a different Touch association... (Don't ask, it's complicated.) On Wednesdays at Woopi he plays in a team with Cait - a mixture of Dads and teenagers - so there is a bit of a Dad-Daughter bonding thing happening there with a shared sport. With the touch, the bike riding, and all the adventure stuff, he's also looking pretty trim, fit and healthy despite the odd grey hair! Me? I'm still simply CEO Domestic Affairs (and Chauffeur to the Children) and still trying to figure out what I want to do when I grow up. In June I spotted an ad for late enrolments for a 6-month TAFE course in work skills & training (CEEW - Careers, Education & Employment for Women), and so jumped in and did that, as much as a confidence re-building exercise as anything else. No epiphanies, but the outcome from it is that I am enrolling in a Cert IV in IT (Websites) in 2009. After getting a good rap from the Writing/Language teacher [* with that XC ski article linked above], I am also going to pursue my interest in writing with a view to getting some stuff published eventually. My recreation and fitness (ie. free time) suffered a bit as a consequence, and despite all the bike riding madness, in only two months I have managed to undo any headway I may have made in the weight loss department. One day I'll learn that I can't keep eating with reckless abandon just because I've done a few long bike rides. 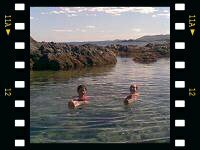 I've kept up my swimming squad, at least once a week, twice when I could, and in late February I did the 2km course in the Coffs Jetty Swim, just to see if I could. (I could!) My ladies midweek tennis was a bit underwhelming; too many players in the team, not enough games, and a bit of a fizzer. A shame, it put me off my tennis, and I won't get to play in '09 now. It will be a challenge to keep up my exercise along with this course, and the after school "taxi" service. I also keep succumbing to niggly and inconsistent aches and pains - back, hip, knee, feet - which cramp my style at times. I continue to do the website stuff for the netball association and the Bicycle User Group, so between us we have been doing our little bit for community volunteering. 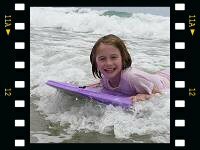 We opted for a "staycation" over Christmas and New Year and enjoyed a few great days of beach weather and good surf. 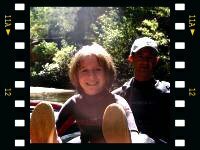 Marc has taught me to bodysurf over the past few years, and I seem to improve a bit each summer. Zoe, the Cautious One, now comes out the back on her boogie board (Marc tows her out, throws her on a wave, and then catches another in himself), and so it's a bit of a family affair out there these days. 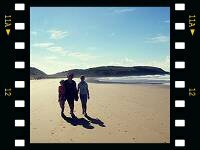 Those moments make us feel very lucky to live where we do. 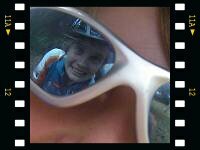 We have to get going with the bike riding again quick smart, as our next cycling adventure looms. 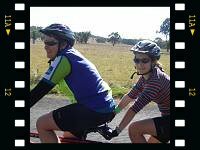 We are heading down to Tassie - all of us, with triple and tandem - in late Feb with a bunch of other tandem riders. 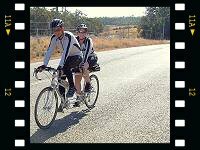 We are organising our own nine day ride (same sort of length as a Big Ride) down the East Coast, from Launceston to Hobart. So.. (now that it's January).. it's a big 'Hope everyone HAD a great Christmas', and that 2009 brings health, happiness, and at least a small dose of adventure.